Katherine Romanak and Hilary Olson are attending the historic UNFCCC COP21 meeting as representatives of both GCCC and UT Austin and are leading outreach efforts on carbon sequestration by hosting several events. Katherine spoke at a Side Event at the COP on Dec. 1 with co-organizers CO2GeoNet, International Energy Agency Greenhouse Gas Research and Development Programme, and Carbon Capture and Storage Association. The event drew a very large and enthusiastic crowd. On behalf of GCCC and UT Austin, both Hilary and Katherine will co-host an Exhibit Booth inside the COP for the entire two-week duration of the meeting. The co-organizers are CO2GeoNet, International Energy Agency Greenhouse Gas Research and Development Programme, and Carbon Capture and Storage Association. UT Austin is also participating in a public outreach booth at the Climate Generations Areas, which is open to the public for the two-week duration of COP. 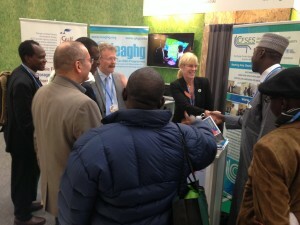 Co-hosts of this booth are CO2GeoNet, Global CCS Institute, International Energy Agency Greenhouse Gas Research and Development Programme, and French Club CO2. and you can check the Twitter feed #UTatCOP where Hilary will be posting up-to-the-minute news.